Let's say the idea of smart growth is a good one. What are the research questions? We could start with definitions. I am particularly attached to my own. 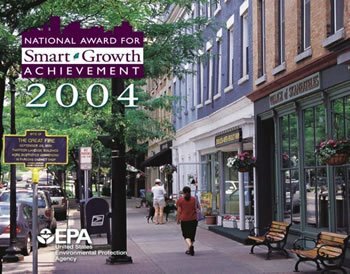 It asserts that the interesting part of smart growth is the deal making process rather than any particular list of best planning practices. My reasoning is that while the new urbanism or neotraditional planning are all about the planning code and design features, smart growth is fundamentally about getting to say yes. As I believe Andres Duany has said, this is driven by the environmental community, in particular their lawyers (and CEQA, the Endangered Species Act, and so on). In return for agreeing to growth, the NAHB is willing to put it in an environmentally sensitive form. Whatever floats your boat, they might say. In this view, smart growth has 3 distinct parts. One is comprehensive, integrated, forward looking planning. (Old news to us but a refreshing concept to laypeople who think the problem is its absence.) A second is a menu of compact development/new urbanist design features, such as mixed land uses, better pedestrian amenities and orientation, higher densities, etc. (This is the public face of smart growth, the basis of its appeal to antisprawl groups.) And the third leg of the smart growth stool is a somewhat different approach to land use governance, in that the environmental community in particular is invited to participate up front via negotiation and mitigation, rather than delaying or blocking things via litigation. I argue it is this last element that got the builders and developers on board -- a revised process -- rather than Seaside esthetics or function. On to research. One could start with the big framing questions, as Boarnet and I did in our book TBD: (1) will it work, (2) is it a good idea, and (3) is it feasible? As examples of the 1st, will compact development relieve traffic problems or will different rules and procedures for community participation facilitate project goals and timelines? Regarding the 2nd, who wins and loses and how are these tradeoffs managed? Finally, if the answers to (1) and (2) are yes, what obstacles to smart growth are found in the standard practice of urban development and planning? There are published treatments of all these, none particularly satisfactory. (I include my relevant work here, as well as Jonathan Levine's new Zoned Out.) The details of (2) and (3) especially are only barely documented, let alone explained. I say this partly to justify my wonder that smart growth is rarely questioned as means or goal, even in academia, when our scholarship is so thin that our confidence in any one of its constituent parts is shaky. Each of these larger questions contains a variety of more detailed hypotheses, where better data and methods would help move our understanding of things along. There is much yet to know about what does and doesn't happen and how and when and under what circumstances. We can agree on this even if we all want to grow smart. Researchers who raise such questions are often called skeptics, as though faith should be our guide on empirical questions. If we don't know the answer to basic questions, and have no axe to grind, aren't we merely curious? -One of the seven attitudes. Its positive pole is investigation; its negative pole is suspicion. Skeptics view the world with doubt. -Skepticism (British spelling: Scepticism) can mean:* Philosophical skepticism - a philosophical position in which people choose to critically examine whether the knowledge and perceptions that they have are actually true, and whether or not one can ever be said to have absolutely true knowledge; or * Scientific skepticism - a scientific, or practical, position in which one questions the veracity of claims, and seeks to prove or disprove them using the scientific method. -The Skeptics Society is a nonprofit organization devoted to promoting scientific skepticism and resisting the spread of pseudoscience, superstition, and irrational beliefs. I am definitely not a member of the Skeptics Society. A Quiet Revolution in Women's Travel? Sprawl & the American Dream: Reviews of "Suburban Nation", "How Cities Work", and "Picture Windows"
Review of "One-Fifth of America"
Prof. Krieger's "This week's finds in planning"
R. Beauregard, When America Became Suburban, U. Minnesota Press, 2006. M. Boarnet & R. Crane, Travel by Design: The Influence of Urban Form on Travel, Oxford, 2001. R. Bruegmann, Sprawl: A Compact History, U. Chicago, 2005. Does the Built Environment Influence Physical Activity? Examining the Evidence. TRB and IoM of the National Academies of Science, 2005. A. Forsyth, Reforming Suburbia, UC Press, 2005. B. Frieden and L. Sagalyn, Downtown Inc., MIT Press, 1989. M. Kahn, Green Cities, Brookings, 2006. J. Levine, Zoned Out, Resources for the Future, 2005. S. Mallaby, The World's Banker, Penguin Press, 2004. V. Mukhija, Squatters as Developers, Ashgate, 2003. B. O'Flaherty, City Economics, Harvard, 2005. L. Sagalyn, Times Square Roulette: Remaking the City Icon, MIT Press, 2001. D. Shoup, The High Cost of Free Parking, APA Press, 2005. E. Talen, New Urbanism and American Planning: The Conflict of Cultures, Routledge, 2005. D.J. Waldie, Holy Land: A Suburban Memoir, Norton, 2005.